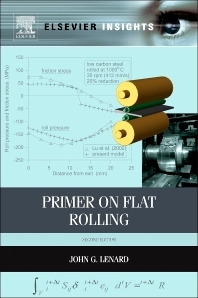 Primer on Flat Rolling is a fully revised second edition, and the outcome of over three decades of involvement with the rolling process. It is based on the author's yearly set of lectures, delivered to engineers and technologists working in the rolling metal industry. The essential and basic ideas involved in designing and analysis of the rolling process are presented. The book discusses and illustrates in detail the three components of flat rolling: the mill, the rolled metal, and their interface. New processes are also covered; flexible rolling and accumulative roll-bonding. The last chapter contains problems, with solutions that illustrate the complexities of flat rolling. New chapters include a study of hot rolling of aluminum, contributed by Prof. M. Wells; advanced applications of the finite element method, by Dr. Yuli Liu and by Dr. G. Krallics; roll design by Dr. J. B. Tiley and the history of the development of hot rolling mills, written by Mr. D. R. Adair and E. B. Intong. Engineers, technologists and students can all use this book to aid their planning and analysis of flat rolling processes.